Lawndale, CA – Today the Rotary Club of Lawndale hosted fire fighters from our local fire station, Los Angeles County Fire Department Station 21. Captain Mike Dodd, Robert Smith FFS and Clint Sanchez FF spoke to the club about the nature of their primary responsibility in responding to emergencies in our community as well as their efforts to assist our community through many other avenues as well. Captain Dodd educated club members about the Rescue Youth Program that brings troubled students into the fire station after school to teaching them about what it means to be a fire fighter and the career opportunities the Fire Department offers as well as provide tutoring and mentorship. Additionally, club members learned about the Explorer Program for 15 to 21 year olds. The goal of this program is to provide participants with a sense of responsibility to his/her neighborhood through ongoing community related activities. The Rotary Club of Lawndale looks forward to partnering with our local Fire Station crews on these and other potential programs in the future. 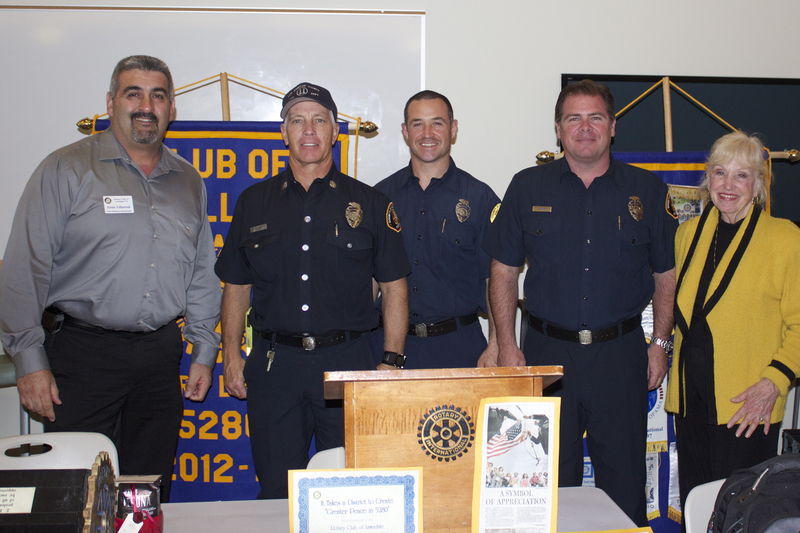 From Left to right; Ernie Villareal Lawndale Rotary Club President, Los Angeles County Fire Department Captain Mike Dodd, Clint Sanchez FF, Robert Smith FFS, and Shirley Glitzow Rotarian.